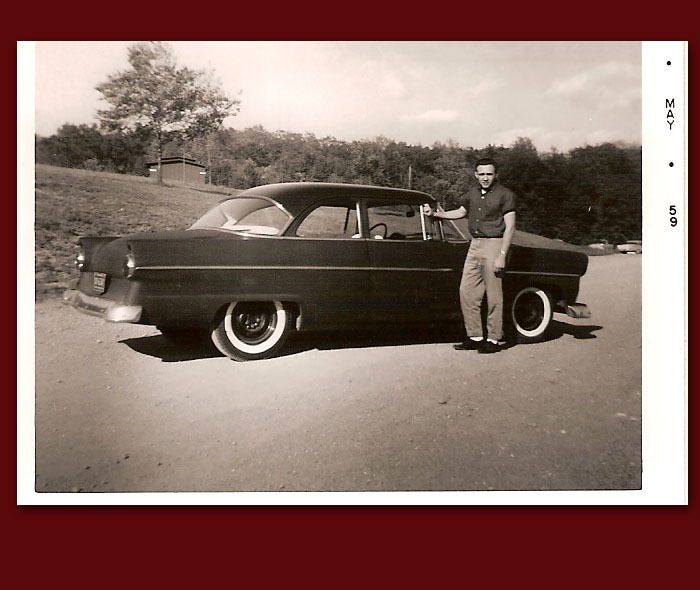 This very cool 1955 Ford Customline 2-door, in dark gray primer, belonged to Otto Pope. The picture was taken at Camp Dearborn in 1959. Otto attended Edsel Ford High School and was one of the few members of The Road Runners Car Club that did not attend Dearborn High. The body was modified with hood, trunk, misc. chrome script, and door handles removed and leaded. Solenoids opened the doors. The front end was lowered 4 inches, the car ran "big tires" all around, and flat tail lights were installed. The rear hood corners were rounded and the body was blended to match. The 2-door had a custom red and white interior installed by highly skilled Mexican craftsmen, in a shop on Livernois, north of I-94. The engine modifications included an aftermarket intake manifold, Holly 4 barrel, and a Spalding "Flame Thrower" ignition system. The car was painted white in the summer of 1960.